MANILA, Philippines – The August 2018 Guidance Counselor board exam results including the official list of passers, topnotchers (top 10), top performing schools and performance of schools are released online on Monday, September 3, 2018 or in two (2) working days after the exam. As announced, 307 out of 471 passed the exam. 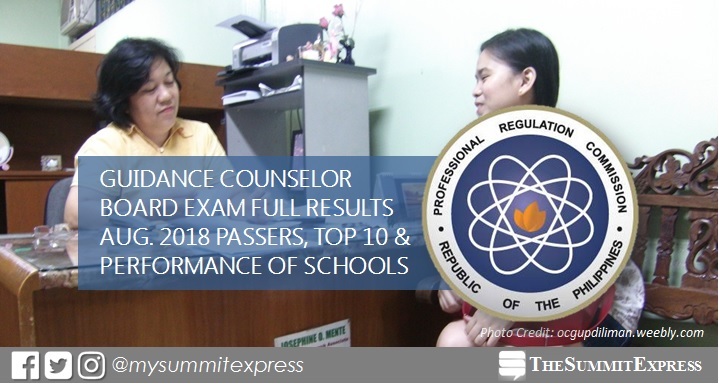 The Professional Regulation Commission (PRC) conducted the Guidance Counselor board exam on Wednesday and Thursday, August 29 and 30, 2018 in the cities of Manila, Cagayan de Oro and Cebu. From September 6 to September 10, 2018, registration for the issuance of Professional Identification Card (ID) and Certificate of Registration will be done on-line. Please go to http://online1.prc.gov.ph and follow instructions for initial registration. In just few working days after the release of results, all examinees may verify their ratings online through PRC's eServices. Enter the required information in the appropriate fields below to verify your identity. The two-day exam covered the following subjects: counseling theories, tools and techniques, career guidance and foundation of guidance (August 29); and group process, psychological testing, organization, administration and supervision of guidance services and program development (August 30). According to PRC Resolution No. 2017 - 1068 which deals with the "Schedule of Licensure Examinations for Year 2018", the target release date of Guidance Counselor board exam results is on Monday, September 3, 2018 or in two (2) working days after the exam. Note that results may be released ahead or on later date without prior notice. We advise takers to constantly monitor this page for the updates. In the August 2017 Guidance Counselor exam, results were announced in two (2) working days. A total of 256 out of 393 passed the tests. Rachelle Abadilla Bersamin of Ateneo de Davao University topped the board with 90.15%. It was followed by Kent Jan Aguirre Beldia of University of the Philippines (UP) - Visayas with 89.30%. In the August 2016 licensure exam, results were released in three (3) working days after the exam. A total of 239 out of 390 passed the exams. Norman Lou Sexcion Padilla of San Pedro College - Davao City topped the board with 87.20%. It was followed by Adamson University graduate Shierene Ducosin Raquipo with 86.60%. In the August 2015 examinations, results were made available online in just two (2) working days. PRC named 252 out of 419 who have passed the exam. Karina Mae Alipoyo Uy of Cebu Normal University (CNU) got the highest place with 89.45%. It was followed by Central Philippine University (CPU) alum Charlotte Cacho Leigh with 89.05%. Monitor this page for the real-time results or visit the official website of PRC (prc.gov.ph) for more information.